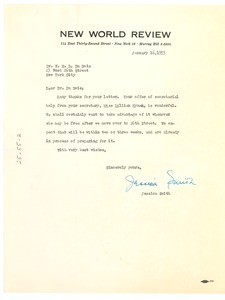 New York (N.Y.) - Addressed to Jessica Smith; thanking her for the translation of the "Pravda" review (enclosed in mums312-b140-i419); noting Lillian Hyman's faithful service to his office; and offering her up to Smith's office, as "During 1953 I shall be away in February, and possibly at other times during the year." 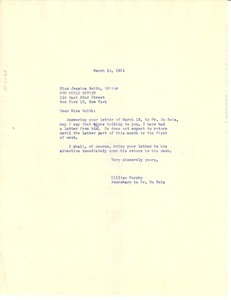 New York (N.Y.) - Responding to a previous letter; explaining that W. E. B. Du Bois will not be returning to town until the end of the month or the beginning of the following month. 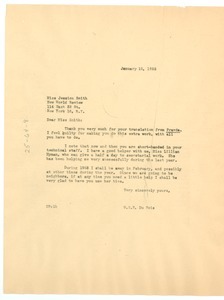 New York (N.Y.) - Signed Jessica Smith, editor; thanking him for his letter and offer of Lillian Hyman's services (mums312-b140-i420); noting the secretary is "wonderful"; and hoping to take advantage of her availability after the offices relocate to 26th street.